Microsoft will launch Payments Request API to Microsoft Edge with upcoming Windows Creators Update. The API is now Available for testing in Insider builds. The Payments Request API will work with Microsoft Wallet on both PC and Mobile to make checking out on websites that opt to support it. The Payments Request API was designed in concert with other members of the W3C Web Payments Working Group in an effort to standardize a better payments experience across browsers and merchants. Earlier this year, Google also implemented the API to Chrome 53 for Android. In Microsoft Edge, the Payment Request API connects to Microsoft Wallet (with the user’s permission), allowing easy access to payment information associated with the user’s Microsoft Account. Because payment information is securely saved in a digital wallet, shoppers don’t have to navigate through traditional checkout flows and repeatedly enter the same payment and shipping address information repeatedly. The wallet can provide a faster and more consistent experience across websites, which saves shoppers time and effort by allowing them to securely share saved payment information. 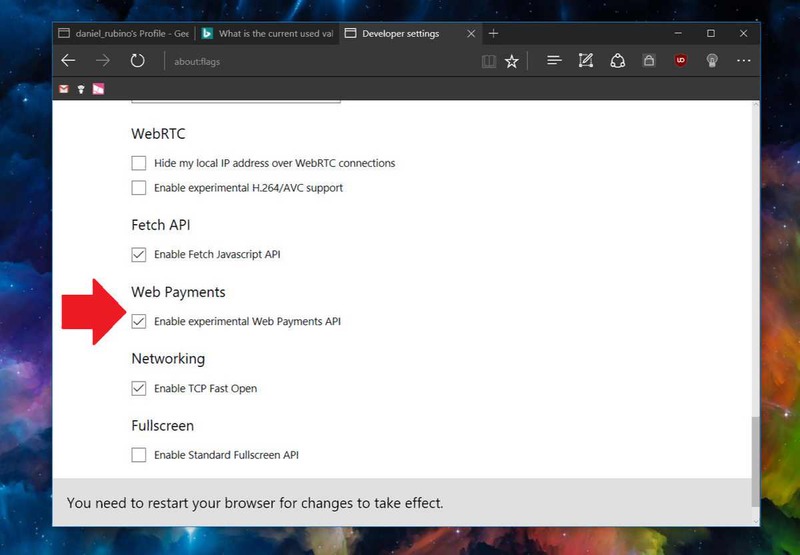 If you’re on Windows 10 Insider build 14986, you can try experimental Web Payments API by going through about:flags in Edge.